After spending several hours on the beach swimming and sunning this afternoon...we decided to take a little break and have a late lunch. I had one flaxseed wrap left from yesterday morning's breakfast burrito that I made (using the Wheat-free Market flaxseed wrap mix) since it makes 2 wraps. I saved it (in the refrigerator) to make a sandwich wrap for lunch today. 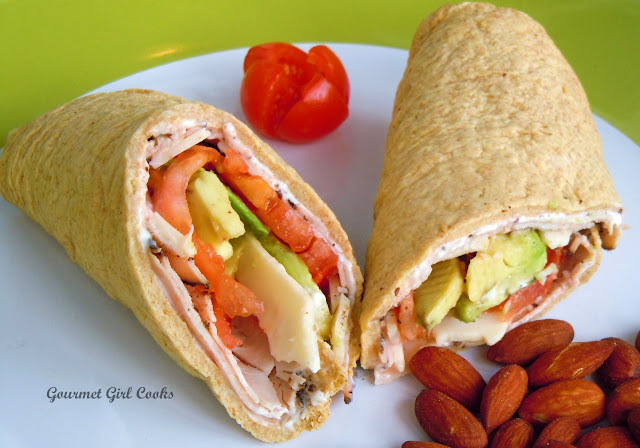 I spread a thin layer of mayonnaise on the wrap and then topped it with thin slices of Boars Head Turkey Pastrami (wheat/gluten free), thinly sliced sharp white cheddar cheese, sliced avocado and tomato and then rolled it up and served it alongside some roasted almonds. The wraps made a great sandwich! I snapped a couple quick photos for you to see below. Enjoy! Hmm! Easy and tasty! That's a winner. Thank you! 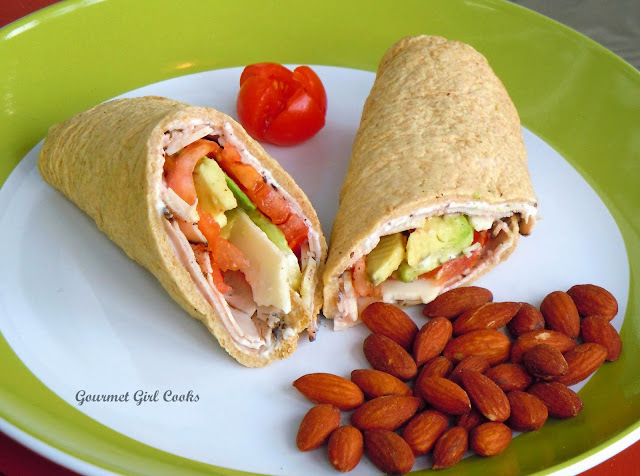 Are these wraps similar to the one in the WB cookbook? These look much paler in comparison. Also I don't care for the flavor of the wraps from WB, I'm assuming other seasonings can be used in place of the ones from the cookbook. Do you have any suggestions? I beleive it's paprika and onion powder, it's just a bit per powering for me. How do you do your wraps? I was wondering if you made these in the microwave or in a pan? Thanks for your blog, it's great!